Are you looking for some way to compete and show off your fabulous trail horse? Ever wonder what endurance riding is all about? Have you heard of the Extreme Cowboy Race? Then look no further! There are tons of different competitions and shows that those looking for a little bit more than a pleasure ride can do right here in Maryland. Obstacle courses are a good way to get started in trail competitions. These are generally held in an arena or in a small enclosed field. These classes are speed events, but “in an arena you really can’t go too fast,” explained Hicks. 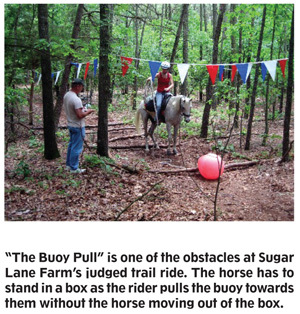 There are usually about 10 obstacles, most of which you would see in the judged trail rides and cowboy races. Competitors are judged on how quickly they navigate the whole course. 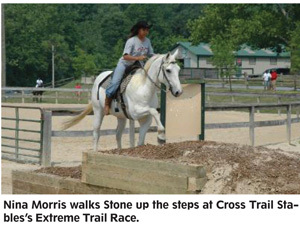 At a judged pleasure or trail ride, competitors head out onto a marked trail where they will encounter 10 to 20 obstacles. These obstacles are typically natural objects, such as logs, stream crossings, etc. However, at times, man-made obstacles are created to simulate a challenge one might come across on a trail. On these rides, judges are stationed at each obstacle and give a score for each rider based on how well they navigate the obstacle. 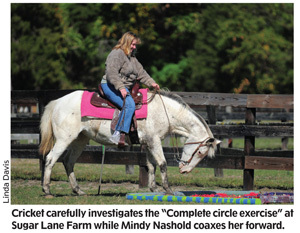 “Typically, most competitions will give each rider two minutes to complete the task,” said Kimberly Hicks, who runs these sort of competitions, among others, at Sugar Lane Farm in Federalsburg. Hicks stressed that these competitions are not timed based, with most taking up to three hours to complete. They are performance based competitions that only cover around 10 miles or less. Now, take the concept of the judged trail ride, make it into a speed event, and you have the Extreme Cowboy Race. These races are growing in popularity on the East Coast and are sponsored by a few different organizations and farms. Competitors are judged not only on how well they navigate each obstacle, but how quickly they complete the whole course. 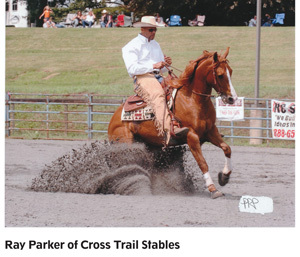 In Clinton, Ray Parker of Cross Trail Stables specializes in preparing riders for these races and has both a practice area and a competition course. He held his first race in May 2006 with about 30 contestants. “We ran it in two parts: a qualifying round, and then a prize round broken up into divisions,” he said. Since then, the races have attracted up to 100 people a year. 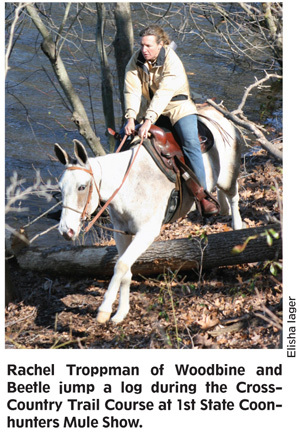 Parker explained that the concept for these races originated with Craig Cameron, a regular at the Maryland Horse World Expo, as a “notch up on trail rides. Everything you see during the race is what you’ll see on the trails.” The races were only held in the Western states, so Parker decided to start hosting them here in Maryland. The official Craig Cameron Extreme Cowboy Race, which can often be seen on RFD-TV, will be making its first appearance in Maryland this year, hosted by Carolyn Mackintosh of Loch Moy Farm in Adamstown. The race will offer the typical three divisions—pros, non-pros and youth—and will be preceded by a clinic with Joyce Lewis, a veteran competitor. At the clinic, Joyce will review with participants “the basic control they need to have with their horse[s], and desensitizing prior to being in the saddle.” From there, she will help riders work through a mock course to practice for the race. The actual competition will be run much like Parker’s races, with the top riders from the first part of the competition returning for a final race. Endurance riding might just seem like a glorified trail ride, but in reality it is so much more. The American Endurance Ride Conference sums up the sport in its motto “to finish is to win.” Asking your horse to travel 25 to 100 miles in a day is asking your horse to literally complete a marathon of a trail ride. The goal is to be the first one to cross the finish line, but only after passing several veterinary checks along the way. So what is the attraction? For Claire Godwin,DVM of Gaithersburg, it is the whole atmosphere of the sport and the people who compete that attract her. “Horsemanship is more important than winning. The people are unpretentious, all breed types are represented and there are many different types of competitions you can do,” she said. Competitors can enter a ride with the goal of winning or can apply for various ride mile awards. They can sign up as individuals or even as a family. Awards are given out for single season mileage as well as life mileage milestones. Short distance rides start at 25 miles and long distance rides are up to 100 miles. 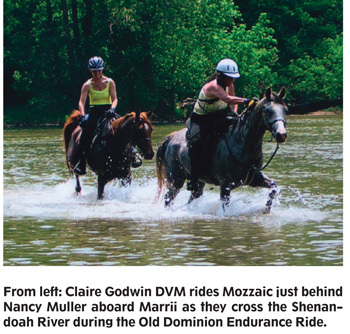 Competitors can stay local, though Godwin pointed out that “Maryland has never had a huge amount of endurance rides.” Both Godwin and fellow endurance rider Samantha Kramer (formerly Sandler) of Rockville feel that the Foxcatcher ride at Fair Hill in Elkton is the best one in the state. Godwin, who has been involved in the sport for 20 years, currently has four horses that she competes and now has helpers to assist with their fitness program. “Most people have one or two horses. It really is a sport that anyone can do,” she said. Currently she has 5,000 life miles and has already completed 300 miles this year. 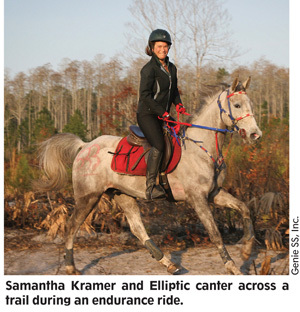 Kramer first started endurance riding 11 years ago after competing in dressage and eventing as well as foxhunting every winter. In endurance riding, Kramer “had found a sport I really liked and started doing every 50-mile race I could find within [a] five hour [drive].” These early years were aboard her first Arabian Zeke. “Zeke was amazing and he came in [the] top five of almost every race we started,” she said. The pair progressed to 100-mile races and, in 2004, had competed in six of them. Kramer and Zeke earned a Certificate of Capability to compete in the Pan American Games but Zeke was diagno sed with degenerative joint disease and now, after surgery, is retired to pasture life. Kramer is still looking to compete for the U.S. at an international competition and has set her sights on the 2010 World Equestrian Games in Kentucky. Her current top horse is Elliptic, on whom she finished third at an Federation Equestre Internationale 50-mile ride in Florida and won the FEI 75-mile ride in Georgia aboard this past March. Now all she has to do is finish in the top 10 at two FEI 100-mile rides to secure an invitation to the WEG “Pre-Ride” this October, also held in Kentucky. “It is a long shot to be on the team, but it is a real possibility,” she said. Competitive trail riding measure the fitness of the horse as well as judging the rider on their horsemanship. 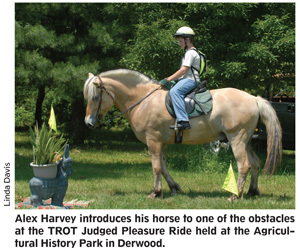 These rides are a cross between a judged trail ride and an endurance ride. They tend to be longer than a judged trail ride and often include judged obstacles. Like an endurance ride, time plays an important factor; however, in this case, riders are penalized for going too slow or too fast. There are also several veterinary checks, like in endurance riding. Distances are typically 20 to 120 miles and can span up to three days for one ride. Ribbon chases take on many forms and themes. Each spring, you’ll find Easter-themed chases where the object is to find as many Easter eggs along the trail as you can. At other times, you’ll just see various colored ribbons tied to tree branches. The object is to count the most number of whatever the theme is within the time limit AND come back closest to the optimum time, which is not posted, so riders have to guess what it is. In a way, hunter paces are similar to ribbon chases—however, there is no counting involved. At these events, riders in teams of at least two follow a marked course, either on the flat or over jumps. They are supposed to maintain a “hunt pace,” meaning a pace you would typically maintain while foxhunting, with the goal being to finish the course closest to an unknown optimum time. Some of these events, which typically occur in the spring at the end of the foxhunting season, also offer “fast time” divisions over their higher jump courses. For that division, the object is to get through the jump course, typically about four miles long with jumps averaging 3’6’’, as quickly as possible.